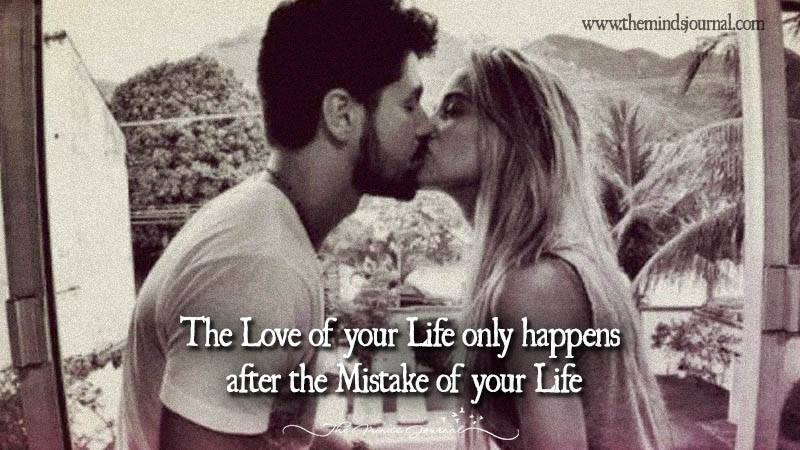 Love of life happens only when we commit some mistakes! A love that is painful is the worst kind of heartbreak. it was the one you risked everything for—only to find it was a bet that you could never win. We all make mistakes when it comes to love. We choose our partners based on the lessons that our souls need to learn. And we do this without realizing that it is normally those painful lessons we need to go through the most.We can’t be transformed through an easy life and we can’t have our minds expanded by the mundane. Rather, it only happens when we are left with only ourselves and our regrets. Perhaps there’s no such thing as a mistake if it’s what we needed to learn more about our true selves and how we love. Yet of course, there will always be those loves we wish we could go back in time for, and just fix. Those ones with endings that were too painful for us to want to permanently write down as part of our past. The absolute truth is, we need a big mistake to propel us towards the love of our life. We have to fall apart in order to find out how we want to put ourselves back together. More often than not, the biggest mistake in our love lives is staying in a relationship that we should have walked away from the minute it began. Or, at least should have let go of way before we actually did, and long before it all went chaotically downhill.But we didn’t, and it’s not because that love was meant to be, but because without it we might never have realized what love truly is. No matter how many times we hope it will end differently, it never does. But it’s not meant to. Embrace it with open arms when love is being bestowed upon you.